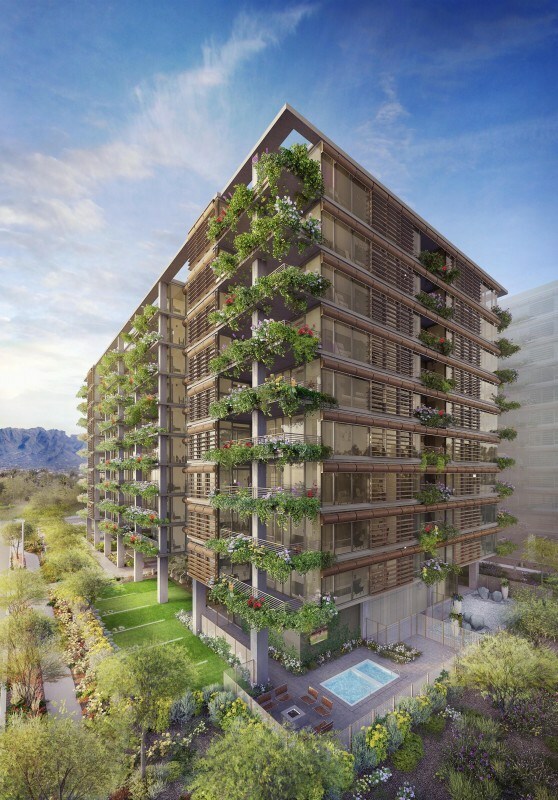 7160 Optima Kierland, a 10-story boutique leasing tower in the north Scottsdale Kierland neighborhood, is hosting its grand opening on February 16, 2017, and pre-leasing for priority list registrants is now underway for the luxury high-rise community where residents will begin moving in late April 2017. Located at 7160 East Kierland Boulevard, 7160 Optima Kierland includes 150, studio to three-bedroom residences, ranging from 595 to 1,795 square feet. Available for 12- to 15-month lease terms, the rental rates range from $1,425 to $5,275 per month. Representing the next evolution of Optima’s vision, the new tower is replete with a wide array of top-tier amenities. The Sky Deck sets 7160 Optima Kierland apart from all other leasing opportunities in the Valley. Situated atop the 10-story tower, the Sky Deck features negative edge railing, which provides uninterrupted views of the mountains, desert and city. Fully equipped with amenities designed to promote a healthy lifestyle, the Sky Deck includes a heated lap pool, spa, steam room, sauna and hydrotherapy. The rooftop garden, outdoor bar, barbecues, fire pits and lounge areas, and cabana-style seating provide spaces for entertaining and relaxing. The Residents’ Club features a spacious movie theater, party room with an indoor kitchen, lounges, a business center, and a conference room, in addition to an outdoor lounge and barbecue area. The approximately 16,000-square-foot indoor/outdoor fitness center offers cardio and weight training equipment, on-site personal training, massage room, WellBeats™ virtual fitness program, group fitness area, locker rooms, yoga room and Zen garden, strength training, and fully equipped sports areas including an indoor basketball court and putting green, among other features. Services provided to residents include a state-of-the-art controlled access system, secure indoor parking, concierge, 24/7 automated package and dry cleaning retrieval, 24-hour complimentary coffee service, and complimentary towel service, among others. Enhanced technology is a distinguishing feature of 7160 Optima Kierland, and is integrated throughout the entire community, so residents may access top speed internet service from anywhere at Optima Kierland. All residences and amenities are networked for internet speeds up to one gigabit, with guaranteed minimum 150 Mpbs for uploading and downloading, supporting business and personal digital requirements.